Reverse mortgages are a versatile financial tool that nearly a million homeowners have used to age-in place, and for other reasons. However, like any financial product, reverse mortgages should be considered carefully before deciding whether to obtain one. 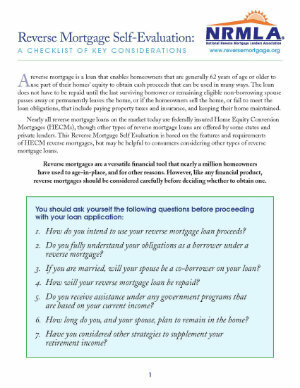 The National Reverse Mortgage Lenders Association’s free Reverse Mortgage Self-Evaluation: A Checklist of Key Considerations poses seven questions and important considerations interested consumers should ask themselves, and think about, before proceeding with a loan application. One of the advantages of a reverse mortgage loan is that borrowers generally have the freedom to use their cash proceeds any way they choose. Eligible homeowners obtain reverse mortgages for many reasons. A reverse mortgage is a non-recourse loan which means that the borrower or the borrower’s estate will never be obligated to pay the lender more than the loan balance or the current value of the home, whichever is less. When a loan is called due and payable, the reverse mortgage borrower or the borrower’s estate only needs to repay the lesser of either the loan balance or 95% of the home’s appraised value at that time. Feel free to distribute copies of Reverse Mortgage Self-Evaluation: A Checklist of Key Considerations to each and every client.